China’s top steel mill says domestic usage has probably hit a peak and will stabilize at these levels, as absolute growth in the economy offsets changes in in the nature of demand. “The Chinese economy is moving from high-speed to high-quality growth, but the growth is still certain and the growth rate globally isn’t low,” Chen Derong, chairman of China Baowu Steel Group Corp., said in an interview Tuesday. That’ll counter the broader re-balancing away from investment and toward consumption, and lead to “stabilized circumstances for an extended period,” he said. 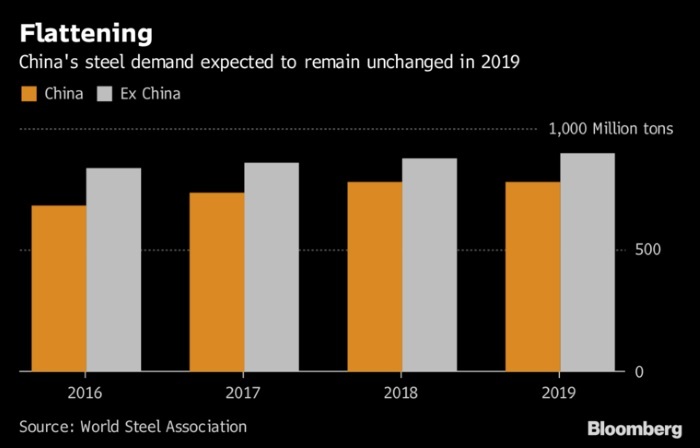 Prices in the world’s biggest producer and consumer of steel surged to a seven-year high in the summer, bolstered by capacity cuts and an environmental crackdown. The risks to demand have since been piling up as China jousts with the U.S. over trade. Economic expansion slowed to 6.5 percent last quarter, its weakest pace since 2009, while imports of iron ore, the raw material for steel, contracted in the first nine months of the year. Still, prices remain relatively buoyant, indicating that the economy is doing fine and that domestic demand is resilient, Chen said on the sidelines of the China International Import Expo in Shanghai. His view suggests that consumption is moving in sync with production, which other commentators have forecast will top-out this year before falling in 2019. Futures on steel reinforcement bar, used in construction, fell as much as 1.1 percent in Shanghai following Chen’s comments, while iron ore dropped as much as 0.7 percent in Dalian. Baowu’s listed unit rose as much 1.1 percent in Shanghai. -On iron ore, Chen said China’s environmental requirements are boosting demand for both higher grades of the mineral and advanced technology and equipment. Iron ore consumption should stabilize for a period, before sliding as China eliminates steel capacity, he said, without giving a time-frame.